I don’t know about you, but my idea of a perfect breakfast would be to have plenty of piping hot toast, apart from lots of freshly churned butter and some strong, black coffee at the side with full cream milk to complete the delicious meal. 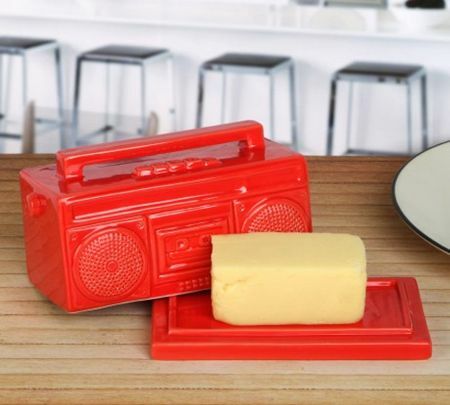 Since buttery goodness can be rather difficult to come by at times, you might want to make a strong visual statement of your choice of butter with the $17.99 Boomin’ Boombox Butter Dish. Yes sir, it is rather explosive in nature, considering how some of the better butter out there will create a symphony of flavor in your mouth as you bite into that slice of toast. Lay down a fair amount of beats and butter with your bagel, and carry a tune while you pass the butter dish to the rest of the folks sharing your table during breakfast. It is the definitive kitchen tool that will help amp up your kitchen, and it will surely introduce some rhythm to your recipes. The Boomin’ Boombox Butter Dish is made from hand-glazed ceramic and does not need any battery power, although you will need to hum your own tunes.